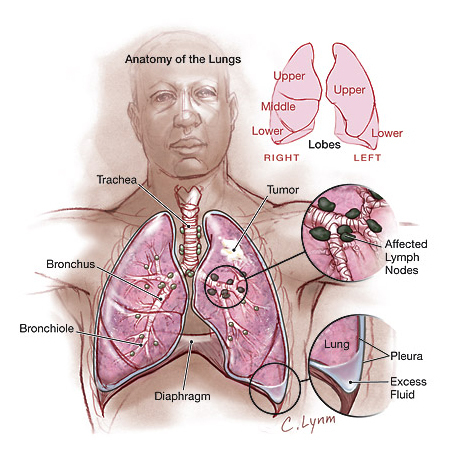 Non-small cell lung cancer : -This is the most common type of lung cancer. It usually spreads more slowly than some other lung cancers. Small cell lung cancer : -This is a less common type of lung cancer and it spreads faster than non-small-cell lung cancer. Tobacco Smoking : - By far the most prominent risk factor is tobacco smoking. More than 80% of lung cancers are thought to result from smoking. The longer a person has been smoking and the more packs per day smoked, the greater the risk. If a person stops smoking before a cancer develops, the damaged lung tissue starts to gradually return to normal. Even after ten years, the ex-smoker's risk still does not equal the lower risk of a person who never smoked. However, an ex-smoker's risk is about half the risk of people who continue to smoke. Asbestos : - Asbestos is found is many workplaces and homes. In the past, it has been used in oven, brake pads, insulation, and many other industrial products Death from lung cancer is about seven times more likely to occur among asbestos workers than among the general population. Exposure to asbestos fibers is an important risk factor for lung cancer. Marijuana : - Marijuana cigarettes contain more tar than tobacco cigarettes. Also, they are inhaled very deeply and the smoke is held in the lungs for a long time. Medical reports suggest marijuana may cause cancers of the mouth and throat. Recurring Inflammation : - Tuberculosis and some types of pneumonia often leave scarred areas on the lung. This scarring increases the risk of the person developing the adenocarcinoma type of lung cancer. Talcum Powder : - While no increased risk of lung cancer has been found from the use of cosmetic talcum powder, some studies of talc miners and millers suggest a higher risk of lung cancer and other respiratory diseases from their exposure to industrial grade talc. Personal and Family History : - People who have lung cancer have an increased risk of another lung cancer. Brothers, sisters and children of those who have had lung cancer may have a slightly higher risk of lung cancer themselves. However, it is difficult to say how much of this excess risk is due to inherited factors and how much is due to environmental tobacco smoke. Other Mineral Exposures : - People with silicosis and berylliosis (lung diseases caused by breathing in certain minerals) also have an increased risk of lung cancer. Vitamin A Deficiency or Excess : - People who do not get enough vitamin A are at increased risk of lung cancer. On the other hand, taking too much vitamin A may also increase lung cancer risk. Air Pollution : - In some cities, air pollution may slightly increase the risk of lung cancer. This risk is far less than that caused by smoking. coughing (when a tumor grew and blocked a passage). hoarseness (caused by pressure on a nerve). difficulty in swallowing (caused by an obstruction of the esophagus). swelling of the neck, face and upper extremities (caused by pressure on blood vessels). Cushing's syndrome (overproduction of corticosteroid hormones). Carcinoid syndrome (excess of serotonin hormone in the body). During the physical exam, the doctor will look for lymph node enlargement in the neck or in the region above the collarbones, liver enlargement, abnormal abdominal enlargement, and signs of a lung mass. Radiation therapy is usually given by external beam, using machines located outside the body that deliver x-rays or electrons to the location of the tumor. The radiation dose is based on the size and location of the tumor. Read More. 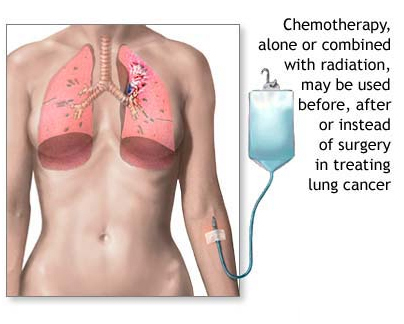 Chemotherapy (treatment with anticancer drugs) is a systemic treatment - the drugs enter the bloodstream and travel through the body, affecting cancer cells outside the lung area. 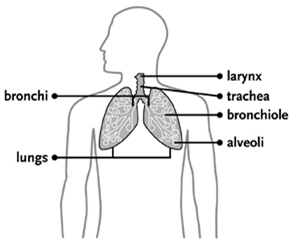 Drugs given to treat lung cancer may be given by mouth or injection to a muscle or vein. Most chemotherapy is taken on an outpatient basis. Read More.